Does Your Kid have a Screen Time Problem? Or, Do You? Brown Mamas' Blog Pittsburgh Does Your Kid Have a Screen Time Problem? Or, Is it You? This post is sponsored by Xfinity. However, all opinions are my own. When most moms think of screen time problems they think of their kids being up late on their cell phones, watching too much YouTube or husbands who watch too much sports. As a Brown Mama I am in total agreement with those thoughts, but I know that my kids and hubby aren’t the only ones with a problem. I can now openly admit that I suffer from screen time problems (and obsession at time) myself. I recently attended an Xfinity Moms event where I’m sure I was not the only screen time obsessed woman in the room. Us mom bloggers are among the screen addicted simply because the nature of our jobs is to be constantly posting on social media, uploading to YouTube and staying up to date on news and community happenings. While I’m sure we all came in with our share of concerns about the next device, or social platform we’d be asked to include in our already heavy digital arsenal, Xfinity actually presented some pleasant options for cutting back on screen time and tuning in to family time. All offer moms the chance to unplug responsibly when necessary, have more access to our children and loved ones, and cutback on spending in order to spend our hard earned dollars on the things that really matter. Here’s a quick overview. Say goodbye to paying for 40 GBs when you only use 2 GB. Xfinity Mobile is accessible to parents currently using Xfinity‘s Internet service. Moms can choose to pay by the GIG ($12 per GB), or decide on unlimited data usage at $45 per month/per line. Xfinity mobile gives parents two simple ways to pay while maintaining access to the network’s numerous WiFi hot spots. This means less cash for GIGs, and more cash for books, birthday presents, or Dragon Ball Z sweatshirts (don’t ask). If you’re like me and have a teenager with serious screen time problems, you’ll love the flexibility of xFi. If you don’t want your teen on the Internet past 10 p.m., but would love to watch Game of Thrones with hubby late night, just shut his xFi off with the tap of an icon. 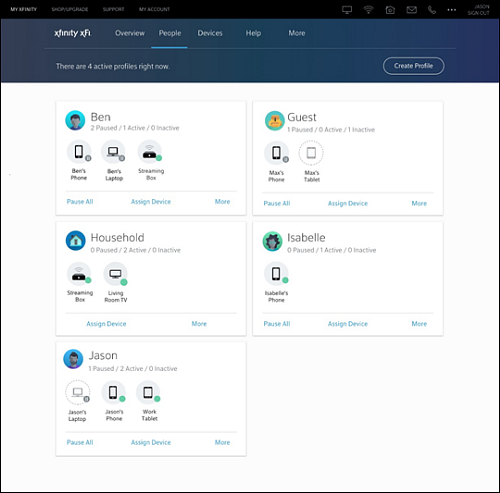 xFi allows parents to group devices by family member. Each family member then gets an “account” where each device can be shut on, off or simply paused. This new feature will also help me with my screen addiction. By setting a pause timer on my own device, I’ll be able to be more accessible to the kids and hubby when they need me, and be connected when necessary. Raise your hand if your kids love cartoons. (insert raised hand emoji here) My kids love cartoons on every channel. We don’t boycott channels in my house, but there are some shows I’d rather they wait until they’re older to watch. So, I was very excited that one of the new Xfinity X1 features is the ability to block individual shows, rather than blocking an entire channel. In addition, Xfinity X1 overdoses on it’s parental control capabilities. Most of the movies and shows on X1 now come with an entire 1-2 minute video detailing the show’s appropriateness for children. (I was seriously wowed seeing this!) To be sure of it’s own effectiveness, X1 uses Common Sense Media’s rating system which is well known for it’s parental control abilities. Just because these are my favorite features, doesn’t mean they’re the only features. Xfinity is offering an entire host of new services for your cell, cable and home security and control needs. Check out their website to learn more, and find out how you can end your screen time problems using the Xfinity line of products. I must be honest…its me!!! Lol I’m so happy to habe come across your site. I live in Fl with my 2 boys and have decided to homeschool. It is not popular amongst brown mamas but I don’t mind being first.